Note: This post is a reblog from the LSE Impact Blog. In Douglas Adam’s famous novel The Hitchhiker’s Guide to the Galaxy, an unsuspecting man called Arthur Dent is lifted onto a spaceship just before earth is demolished by intergalactic bureaucrats. Together with a group of interstellar travellers (including amongst others the President of the galaxy), he then embarks on a journey through the universe to unravel the events that lead to the destruction of earth. To help Arthur better understand the new surroundings he is thrown into, he is handed a copy of The Hitchhiker’s Guide to the Galaxy, a multimedia guidebook that offers wisdom and advice on all topics of interest in the universe. Starting out in a new scientific field can feel very similar: you are faced with a new world that you have to make sense of. Unfortunately, the knowledge needed to understand this new world is not readily structured and summarized in one handy guide, but scattered over millions of scientific articles. To make matters worse, you have no idea which articles belong to the field that you are interested in and which of them are actually important. For many researchers, the starting point in their quest to conquer an unfamiliar knowledge domain is to turn to their personal favourite search engine, type in the name of the field of interest and start reading at the top of the list. Once you have read through the first few articles (usually highly cited review articles), and followed relevant references, you develop an idea of important journals and authors in the field and adapt your search strategy accordingly. With time and patience, a researcher can thus build a mental model of a field. The problem with this strategy is that it can take weeks, if not months before this mental model emerges. Indeed, in many PhD programs, the first year is devoted to catching up with the state-of-the-art. There is also a lot of reading and summarizing involved, but searching for relevant literature usually accounts for a large chunk of the time. And even with the most thorough search strategy, the probability that you are going to miss out on an important piece of prior work is rather high. Another means of getting an overview a research field are knowledge domain visualizations. An example for such a visualization is given above. Knowledge domain visualizations show the main areas in a field, and assign relevant articles to these main areas. Hence, an interested researcher can see the intellectual structure of a field at a glance without performing countless searches with all different sorts of queries. An additional characteristic of knowledge domain visualizations is that areas of a similar subject are positioned closer to each other than areas of an unrelated subject. In the example “Pedagogical models” is subject-wise closer to “Virtual learning environments” than “Psychological theories”. Thus it is easy to find related areas to one’s own interests. Granted, even with a knowledge domain visualization in hand, you would still need to do the reading. But it would certainly save you a lot of time that you would otherwise spend on searching, indexing and structuring. Image credit: Maxi Schramm. Public domain. Knowledge domain visualizations can not only be created on the level of the individual research article. Below you can see a visualization by Bollen et al. (2009) of all of science. 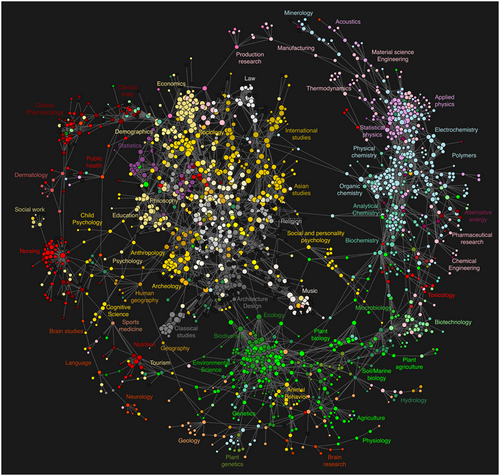 The nodes in the network represent research journals and the different colors designate different disciplines. Even though the idea of knowledge domain visualizations has been around for quite some time, and despite their obvious usefulness, they are not yet widely available. Part of the reason may be that in the past, the data needed to construct these visualizations was only available from a few rather expensive choices. Part of the reason may be that there has been an emphasis on all-encompassing overviews. While they provide valuable insights into the structure of science as a whole, they are usually not interactive and provide little value in day-to-day work where you want to be able to zoom into specific publications. There are several applications out there that can be used to create one’s own overview, but they can usually only be operated by users that are information visualization specialists. Image credit: Bollen J, Van de Sompel H, Hagberg A, Bettencourt L, Chute R, et al. (2009) Clickstream Data Yields High-Resolution Maps of Science. PLoS ONE 4(3): e4803. Creative Commons Attribution 3.0 Unported. In our work, we therefore aimed at creating an interactive visualization that can be used by anyone. 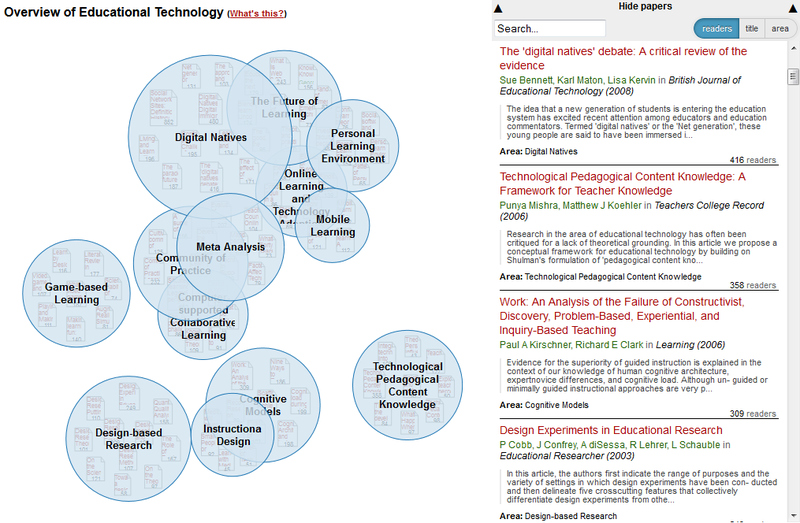 As a first case, we chose to visualize the field of educational technology, as it represents a highly dynamic and interdisciplinary research field. As described in a recently published paper in the Journal of Informetrics (Kraker et al 2015), the visualization is based on a novel data source – the online reference management software Mendeley. The articles for the visualization were selected from Mendeley’s research catalog which is crowd-sourced from over 2.5 million users from around the world and offers structured access to more than a 100 million papers. One of the most important steps when creating a knowledge domain visualization is to decide which measure defines the similarity between two articles. The measure determines where an article gets placed on the map and how it is related to other articles. Again, we used Mendeley data to tackle this issue. Specifically, we used co-readership information. “So what is this co-readership exactly?” you may ask. Mendeley enables users to store their references in a personal library and share them with other people. The number of times an article has been added to user libraries is commonly referred to as the number of readers, or in short readership. In analogy to that, we are talking about the co-readership of documents, when they are added to the same user library. When Alice adds Paper 1 and Paper 2 to her user library, the co-readership of these two documents is 1. When Bill adds the same two papers, the co-readership count goes up to 2, and so on. Our assumption was now that the higher the co-readership of two documents, the more likely they are of the same or a similar subject. It’s not unlike two books that are often rented together from a library – there is a good chance that they address related topics. And indeed, our first analyses indicate that our assumption is valid. The cool thing is that once you have settled on a similarity measure, the process of creating the map can be highly automated. We adapted procedures for assigning papers to research areas and for situating them on the map. We also put a heuristic in place that tries to guess a name for each area using web-based text mining systems OpenCalais and Zemanta. Apart from the fact that you can get a quick overview of a field, there are many other interesting things that you can learn about a domain from such a visualization. Fisichella and his colleagues even argue that mappings like the one above might help to overcome the fragmentation in educational technology by building awareness among researchers of the different sub-communities. There may be some truth to this assumption: when I evaluated the map with researchers from computer science, they discovered research areas that they did not know existed. 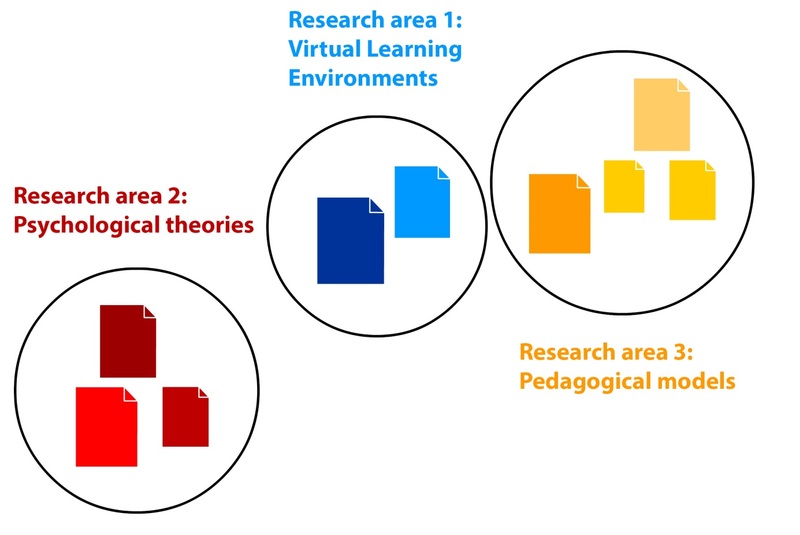 One example is Technological Pedagogical Content Knowledge, which is a conceptual framework emanating from the educational part of the research community. Another interesting possibility is to study the development of fields over time . When I compared the map to similar maps based on older literature (e.g. Cho et al. 2012), I learned a lot about the development of the field. Whereas learning environments played an important role in the 2000s, issues relating to them have later split up into different areas (e.g. Personal Learning Environments, Game-based Learning). You can find further examples in the paper describing the full details of the evaluation which still under review. You can find a pre-print on arXiv. Given the enormous amount of new knowledge that is produced each and every day, the need for better ways of gaining – and keeping – an overview is becoming more and more apparent. I think that visualizations based on co-readership structures could provide this overview and serve as universal up-to-date guides to knowledge domains. There are still several things that need fixing – the automated procedure for example is not perfect and still requires manual interventions. Furthermore, the characteristics of the users have a certain influence on the result, and we need to figure out a way to make users aware of this inherent bias. Therefore, we are currently working on improving automatization techniques. Algorithms, however, will never be correct 100% of the time, which is why we are also experimenting with collaborative models to refine and extend the visualizations. After all, an automated overview can never be the end product, but rather a starting point to discovery. Educational technology experts will notice that some of the newest developments in the field such as MOOCs or learning analytics are missing from the overview. That is due to the fact that the data for this prototype was sourced in August 2012 and is therefore almost 2,5 years old. The evaluation was conducted in the first half of 2013.